Welcome to your comprehensive guide to cap measurements! Over time, we’re going to post articles relating to all the relevant tools one might need when placing a hat order. We will dive into decoration techniques, headwear of all shapes and sizes, ladies hats, youth hats, fabrics, threads, colors, tips from designers, FAQs, and so much more. We’re calling the series All About Headwear. Today’s topic will focus on how to measure hats for fit, curvature, etc. Upon completion, you will have all the tools necessary to aid your customers in selecting the best fit and shape for their needs. To prepare for this article and those to come, don’t forget to brush up on your hat anatomy. Within each section below you will find sizing charts for fitted, adjustable, and stretch fit hats. The difference is all in the closure. Of course, these charts will not be exact for every hat in the world, but they should provide a pretty good starting point if nothing else. To determine your size you will need to wrap either a seamstress measuring tape or a string around your head. Do so about 1/8 inch above your ear and across your mid-forehead. Measure firmly but not too tight where the hat would sit comfortably. If using a string you will then need to lay the string flat against a tape measure to get an accurate reading. If you fall between sizes, it is recommended you select the next size up. Just as they sound, fitted hats are made to fit a specifically sized head and you have to measure the circumference of your head to know which size will fit best. Fitted hats are pretty exact – within an eighth of an inch, so wearing one that is too small will cause some discomfort. When placing an order of fitted caps, it’s important to get a variety of sizes to accommodate your customers. Many styles can be ordered with a variation of closure options. Check them all out and see which ones your customers prefer! These resemble fitted hats in that they don’t have an opening or a closure in the back. Unlike fitted hats, the fabric and sweatband are made to stretch. This allows them to fit a range of sizes smaller than that of adjustable caps but with the styling of a fitted hat. Because these fit an assortment of sizes you don’t have to worry about ordering large quantities of every size and then not selling out of them all. Because of its versatility, this is a really popular choice among team sports. The hat’s profile refers to the height of the crown. 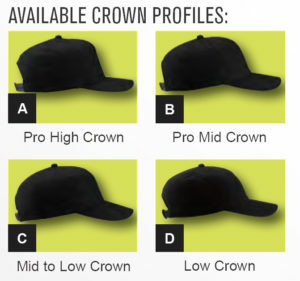 There are four profile heights for ball caps, and they can be structured or unstructured. In addition to closures and crown height, you have options when it comes to the curvature of the visor. Flat visors, also known as flat bills or flat brims, lay level on a surface. Pre-curved visors come in two options: pre-curved and slight pre-curved. It is not uncommon for the wearer to bend or shape his own hat, regardless of the original curvature. In doing so, he can achieve his desired arch. To measure curvature, set the cap on a flat surface. Using the centimeter side of a ruler, measure from the flat surface to the highest point of the visor as shown in the image below. Stay tuned for more informative posts as mentioned above. If you have a topic you want us to cover, let us know in the comments. The purpose of this blog is to help you become an expert on headwear! So stay engaged, and interact with us and we’ll do our best to answer any questions you have! You can also follow us and join the conversation on Instagram by using the hashtag #hatswork.